1. Combine the first 5 ingredients in a large mixing bowl and knead until smooth and soft, but not sticky. Depending on the altitude and humidity, you may need to vary the liquid or the flour. Don’t overwork the dough, or it will become tough and chewy. 2. Brush a tablespoon of oil over the dough and allow it to rest 20 minutes to 2 hours in a bowl covered with a damp cloth. 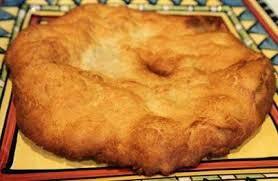 After the dough has rested, heat about a 1/2 inch of oil in a deep frying pan until it reaches a low boil (375º). The traditional puffy texture is achieved by frying the bread quickly! The hotter the oil, the less time it takes to cook. Test oil first. 3. Pinch egg-sized balls of dough and flatten them out into large, saucer-sized circles with no more than 1/4 inch thick. 4. Fry circle one at a time. Allow about 2 minutes cooking time per side before turning dough. When golden brown, place on paper towels to finish draining. Serve hot with honey, jelly, fine powdered sugar, cinnamon, agave, or fill with a breakfast omelet.